We rescued Chuy in spring of 2009 when he was just a little guy. 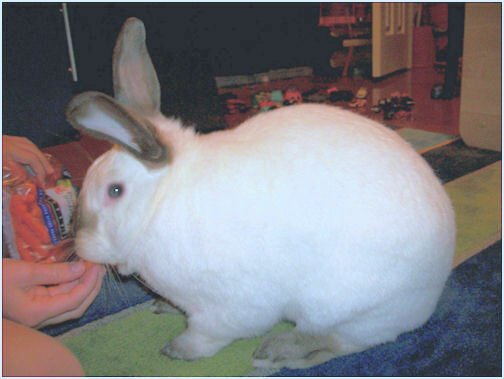 At first, we called him Cotton because of his white, soft fur. After chewing up many pairs of shoes, he became Chuy! The second anything was at his level, he was munching on it! He was a big ball of energy and got into everything! I would set up boxes and other toys for him to play with but he was more interested in getting into everything we didn’t want him to. He was just so curious! When we’d let him run around outside of his room, he would get into everything and then hop onto the bed or couch and stretch out. As he grew, he became very obedient. If he was getting into something he shouldn’t, we could just tell him to stop then he would. If he was under the bed, when we’d call him he’d come out. If we were downstairs and it was time for him to go back to his room, we’d just have to tell him to go upstairs and he’d hope up to his room. He just loved to play with our cats. They would chase each other and then cuddle up. It was too funny! He was so sweet with the kids. He would just chill when they loved on him and he knew how to beg them for a carrot! He loved his cilantro, parsley, and evening treat. If we were late on a feeding or snack, he would nibble our ankles to remind us. Although he was such a hyper trouble-maker, he would always end the day as our little “Cuddle-Bug.” He would plop down and stretch out on his side and let us lay and cuddle with him. He made everyday more interesting and enjoyable. 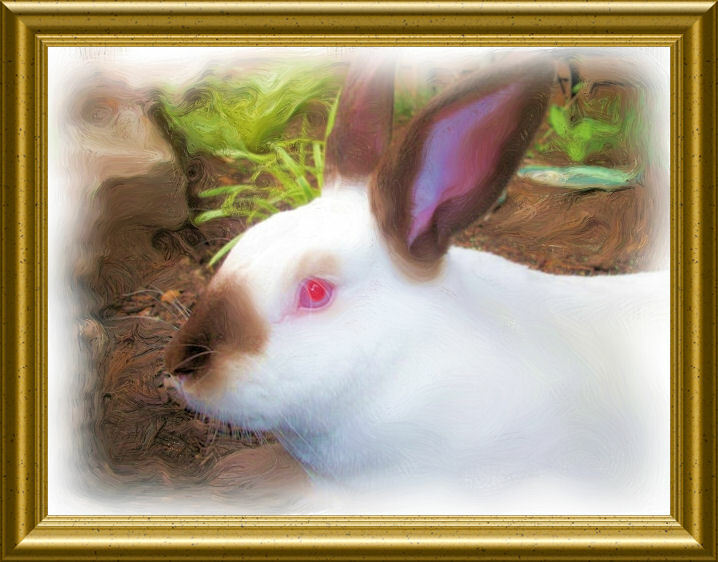 He was such a special rabbit and our home is very quiet without him. We are very glad to know that he is not suffering and can run around on the Rainbow Bridge.